One very important aspect of having a website is how safe and secure it is. WordPress is a top choice for a content management system platform, as many SEO features have been implemented into it. However, it is attacked quite a bit by spam. Which brings us to our concern of WordPress Safety. How safe is it? Well, to be quite honest, WordPress is very safe. The things that make WordPress unsafe is the people who run it. This could be as simple as not updating the site when it needs to be. Any website needs security, as a hacked site could lead to lots of damage. Your information and passwords can easily be stolen if security is not up to date. Or you could find that a hacker made it so malicious software is installed on your site or your clients get malware when they visit your site. 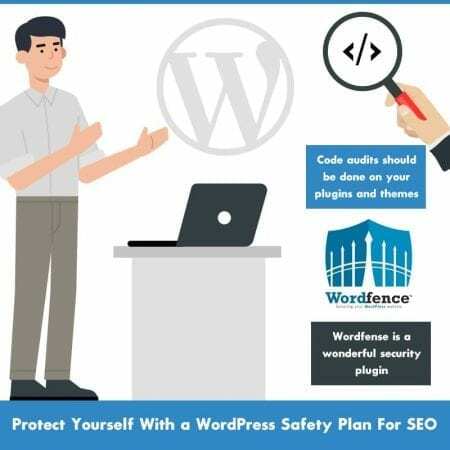 The following measures can be taken to develop a WordPress Safety Plan to ensure your website is secure. Security Updates– WordPress safety can happen when security updates are done. Minor updates are done automatically. However, for major updates, the website owner will need to manually start the update. You can continue to update themes and plugins that are compatible with your system as soon as they become available. These updates are crucial to your site to make sure that it is safe and protected. Secured Networks– Only work on a secured network to be safe. This is something that should be done whether you have an administrator role or not. Do regular scans on your workstation. Use VPNs for end to end encryption if you are using any WiFi, and always block ads. Secured Passwords– All passwords should be long and unique. Never use the same password twice. You should use capital and lower case letters, as well as numbers. Punctuation is a great idea to make the passwords even stronger. It is recommended to use a password that is four or five words in length or use a password generator to really come up with a unique one. Never use short passwords, as these are easy to crack, even if they are unique. It is best to use at least 13 characters. Code audits– Code audits should be done on your plugins and themes. And use the principle of least privilege, which requires that every module can only access information or resources that are necessary for the purpose. Critical files- Any critical files need to be locked down. Some files should only be accessed by the PHP process that runs WordPress. The only thing that this PHP process will be able to do is to read the file. With strict file permission, nothing will be allowed to be written to the file. Security plugins– There are some plugins that can be used for security to see if your site has been compromised. Wordfense is a wonderful option that is updated quite a bit. Google also has a web application that can also scan your pages. By setting up an auditing system, you can monitor everything that happens to your website. This includes any failed login attempts, malware scanning, or file integrity monitoring. If you are uncertain about how to protect your website or need assistance setting up a WordPress Safety Plan, you should consider contacting IB Systems USA. They will deliver top services, are up to date on the latest trends and technologies, and have a determination to provide excellence from the very beginning.